Skincare layering is the cornerstone of any good Korean beauty routine — we know that applying products together is infinitely better than limiting yourself to just one lotion. The newest K-Beauty trend takes layering to a whole new level with a method called the double serum. Whereas layering is about applying a multi-step routine with a variety of products, double serum means cocktailing two treatment products together in order to get maximum results. The name itself is a misnomer, as women in Korea do it with all manner of treatment products including serums, ampoules, and essences. The thinking behind it is that by using similarly textured products that address different skin concerns, you’ll get double (or more!) the benefits. What’s really exciting about this trend is how it allows you to address your skin’s individual needs, which can vary from day to day — everything from what you eat to the weather outside can cause changes to your skin’s natural equilibrium. One of the hallmarks of Korean Beauty has always been serums that are lightweight in texture, as opposed to many of the heavier, stickier treatments of Western beauty. Sarah and Christine attribute the rise in the double-serum technique to an increase in serums with those easily layered textures. It’s what, makes all the difference in being able to use multiple products at once (because they absorb more quickly). Plus, a lower price point ensures that people can afford to have an entire serum wardrobe at their disposal to cocktail to their hearts’ content. A return to cleaner, more natural ingredients in skincare products has also made it easier to mix and match serums because there’s less concern about accidentally combining ingredients that might cause skin irritation. There’s no wrong way to double serum — it just comes down to personal preference and how you like applying your products. If you cocktail, make sure you are fully blending the two together to ensure you get the max benefits of both treatments. If you’re going to layer, apply the serum that’s targeting your main skin concern first, then be sure to let it fully absorb before applying the second. 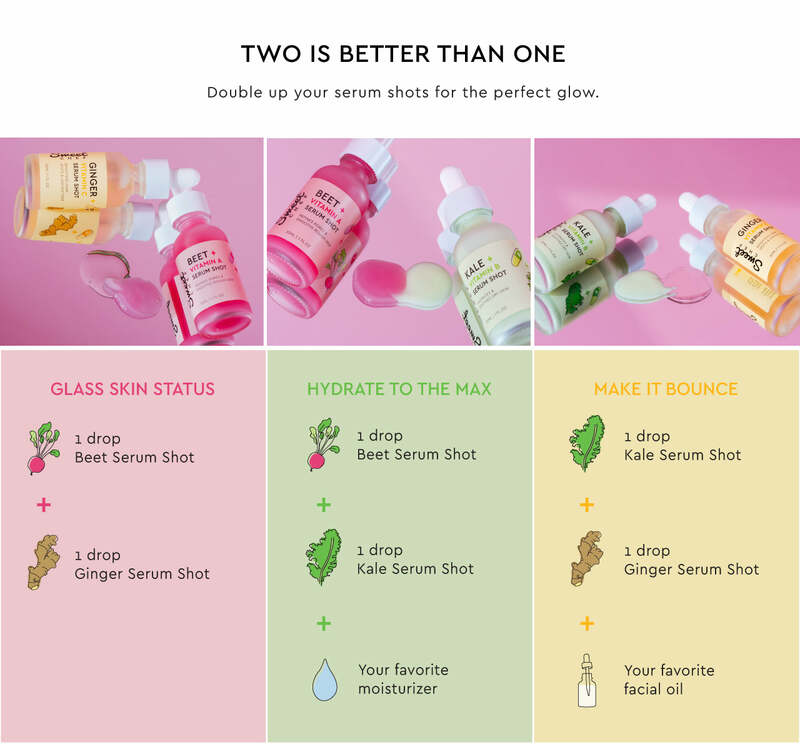 See below for more of our favorite ways to double serum, and let us know which ones you’re stoked to try! I have very excessive dry skin. It so bad that my skin scaling, sore, due to how dry my skin gets. I tried creams claiming to be for very dry skin, bit when i use it like minutes later its like i never put on any moisturizer. Please help. I read that Target would start carrying at least one of your products (the vitamin c serum) on 1/27 but it’s still not on their website. Is there a delay? Just found it! I’m so excited to try it!